Mr Assange called for the US government to "renounce its witch hunt against Wikileaks"
Julian Assange has urged the US to end its "witch-hunt" against Wikileaks, in his first public statement since entering Ecuador's London embassy. He also called for the release of Bradley Manning, who is awaiting trial in the US accused of leaking classified documents to the Wikileaks site. Mr Assange spoke from a balcony at the embassy and thanked Ecuador's president, who has granted him asylum. He faces extradition to Sweden over sexual assault claims, which he denies. Mr Assange said: "As Wikileaks stands under threat, so does the freedom of expression and the health of all our societies. "We must use this moment to articulate the choice that is before the government of the United States of America. "Will it return to and re-affirm the revolutionary values it was founded on? "Or will it lurch off the precipice, dragging us all into a dangerous and oppressive world in which journalists fall silent under the fear of prosecution and citizens must whisper in the dark?" Ecuador's president Rafael Correa has suggested Mr Assange could co-operate with Sweden if assurances are given that there would be no extradition to a third country. 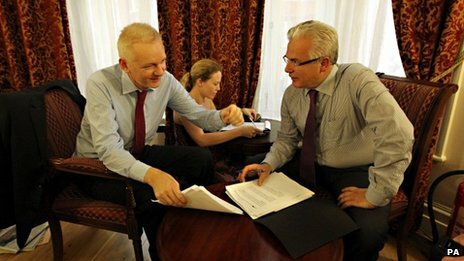 The 41-year-old Australian's Wikileaks website has published a mass of leaked diplomatic cables that have embarrassed several countries, including the US. Mr Assange entered the embassy in the Knightsbridge area after the UK's Supreme Court dismissed his bid to reopen his appeal against extradition and gave him a two-week grace period before extradition proceedings could start.